If you’re the type that gets a kick out of upcycling, then you should really add this nifty little trick to your repertoire. 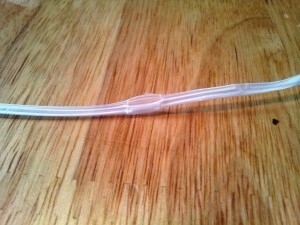 I use this plastic thread to sew buttons and the like onto my plarn creations. I find it a lot easier than just using plarn (plastic yarn made from cutting plastic bags into strips) and a lot more satisfying than using cotton thread/yarn. Update 07/2015: Most plastic bags in the UK are now biodegradable, which means that they will fall apart after a couple of months. 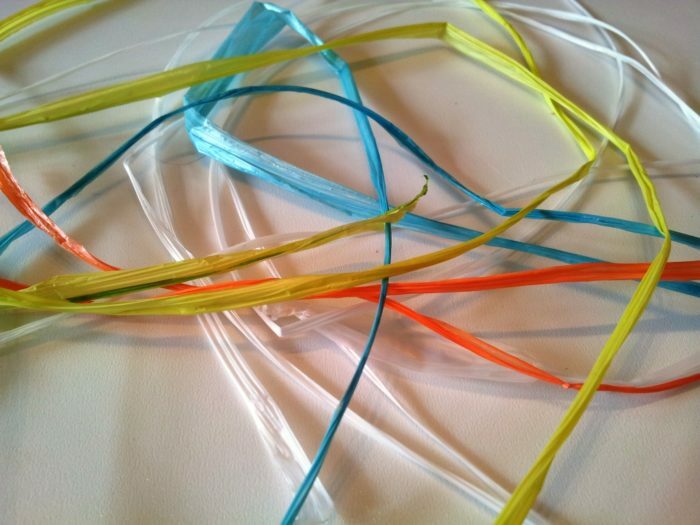 When you make any plarn projects, please make sure that you are using bags that aren’t biodegradable. You will be very sad if your slippers/rugs/bags crumble and fall apart! 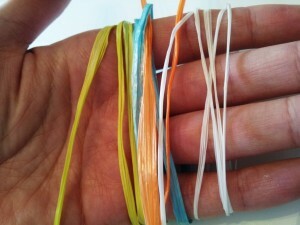 Plastic thread made from Plarn is remarkably strong and feels a bit like thick dental floss when you work with it. It is so easy to make too! Just take a piece of plarn and pull it slowly. You will notice that the plastic becomes see-through. Occasionally you will have a solid bit right in the middle, but that will disappear as you pull. It reminds me of a spark running along a gunpowder line – sort of like in the cartoons. If the plastic snaps, that’s ok too, because you rarely need more than 15 cm’s for sewing on a button and you’re bound to get at least that. 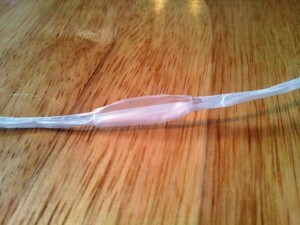 If your plastic keeps snapping, you’ve used a dodgy bag or you are pulling too hard. Try another bit/bag. I have found that Asda bags here in the UK give me the best results and I can usually get a good 3 meters of thread before it snaps. Please bear in mind that not all bags are created equal, so you might need to search around a bit to find your perfect type of plastic bag. 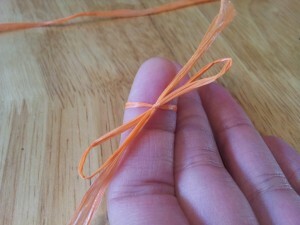 It will usually be the one that stretches when you try to break your plarn at the end of a project. Earmark this post, because you will need this info for my upcoming pattern for Plarn Crochet Slippers. Great Idea, I checked out your pinterest site but i did not see anything relating to Plarn projects was wondering if you have made those slippers yet and if you have a pattern. and do you have pinterest board as of yet devoted to Plarn. Just learning myself to crochet because of plarn. Hi Patricia. I have just updated this post to include the link to the slippers. I have found and error in the pattern (the rounds for the sole spill one stitch into the next round), and am in the process of having the pattern edited and tested, so if I was you I would hold off a few days. 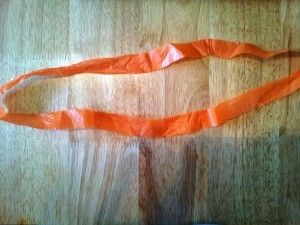 I have removed most of my plarn posts as plastic bags are now predominantly biodegradable here, which means that they start crumbling and falling apart after a few months, making them useless as long-term material.